When it comes to writing down ideas for your next creative project, most creatives will turn to their best notebook. Sure, digital documents have their advantages, but there's something about physically writing that can't be topped. This doesn't mean that all notebooks are created equal though, and there are lots of criteria to keep in mind. Do you go for a hardcover or softcover? Rounded corners or right angles? Or perhaps your deal-breaker is whether or not the pages are ruled. These might seem like trivial details to some, but if you're using your design notepad or notebook frequently, you're going to want something that suits your needs. To help you choose the best design notebook for you, we've rounded up some stand-out options that we think are worth consideration. Each has a different twist or unique selling point. So if you're after a new place to record notes or pencil drawings, maybe one of these notebooks is just what you're looking for. Famous for its frankly dizzying array of business cards, you might not know that MOO also makes notebooks. Built by the company's in-house designers with the same care and consideration as its business cards, MOO's notebooks come with either hard or soft covers. 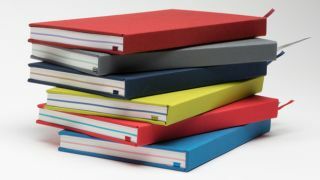 The MOO Hardcover Notebooks here are available in a choice of six colour combinations (split into classic or bright) and are filled with crisp, non-glare, ruled paper. There are also 16 pages of shaded paper in the middle that break up the notebook and give you a space to jot down those sporadic, unrelated thoughts that spring up from time to time. Thanks to their binding, the MOO Notebooks can be laid perfectly flat. This is welcome news for left-handed creatives, who need no longer be hindered by spines creating impractical bulges under the pages. Add to that a quality cloth cover and a slipcase to keep the notebook protected, and you've got one of the best notebooks for designers, at an accessible price. Well, it wouldn't be a list of the best notebooks if we didn't mention Moleskine, would it? In the world of stationery, Moleskine is the Apple of notebooks, with its products generating the same kind of enthusiasm and loyalty as the latest iPhone release. It's funny to think that the Italian company has only been running since 1997, but its relatively rapid success is the result of a commitment to creating quality products. With a straightforward and practical design, plus a luxurious finish that makes them a joy to write on, Moleskine's Classic notebook has really earned its place at the top of the notebook food chain. Even the most basic of Moleskine notebooks feel like something special, and with a variety of different styles, including coloured notebooks, memo books, and two-go textile-covered notebooks to name but a few, it doesn't look like they're going anywhere any time soon. Rhodia Webnotebooks come in a range of sizes and styles to suit different creatives. There are flip cover design notepads for when you need to scribble down ideas on the go, desk notebooks that are perfectly suited to fountain pen users, and even pocketbooks if you're looking for a small and sturdy journal that can travel. Most of the books come in either black or a distinctive cool orange. There's also a variety of page styles to choose from, including plain, ruled and dotted. We especially like that Rhodia offers landscape notebooks as well as portrait. You don't see landscape notebooks all that often, and with their premium ivory paper and faux leather hardcovers, these ones have set the standard. Rhodia isn't the only company to offer colourful notebooks; Piccadilly's Color Essentials come in a wider rainbow of hues so even the most colour conscious creatives can find a style that matches their look. There's also a gorgeous coral notebook that Pantone devotees will know is very on-trend for 2019. These vibrant notebooks come in either small, medium or large and contain ruled pages made from acid-free paper. Complete with hard covers, rounded pages and an elastic enclosure, these books are as practical as they are stylish. Writing from the safety of your home or studio is all well and good, but the Bound Book comes into play if you need to work outside, exposed to the wrath of mother nature. Where most notebooks would wilt in the rain, the Bound Book from the rugged Rite in the Rain company is capable of standing up to storms, grime, and even laundry mishaps (they can happen to the best of us). With a glorious yellow cover made out of an imitation leather material called fabrikoid, the tough pocket-sized Bound Book comes with sewn-in pages coated in a unique moisture shield. This allows users to write in pen and pencil, even if the pages have been soaked. Is it cheating to count three notebooks as one entry? Field Notes is a collection of smartly-designed, vintage-styled pocket notebooks, created by the Draplin Design Company and Coudal Partners. The small notebooks, which measure 3.5x5.5in, come with 48 pages and a saddle stitch binding, are ideal for sketching or taking notes on the go. Best of all, you buy them as a mixed Memo Books 3 pack, so you're spoilt for choice when it comes to page design. Available with plain, lined or graph paper pages, the Memo Book collection is ready to suit any task. Inspired by the "vanishing subgenre of agricultural memo books, ornate pocket ledgers, and the simple, unassuming beauty of a well-crafted grocery list", this trio of journals is an essential on-the-go option for designers. One for the web designers amongst you now: Let us introduce you to the UI Stencils Everyday Carry Kit. Just like the Field Notes Memo Book bundle, this set includes three pocket-sized notebooks with 48 pages each. However, unlike Field Notes, these are specifically aimed at digital designers. Each book in this set contains gridded pages ideally suited to creating digital prototypes. What sets this collection apart from other notebooks is the unique Pocket Stencil. Complete with cut-outs of frequently used UX shapes, such as touch and swipe icons, phone symbols and social media logos, this stencil makes it quicker and easier for web designers to jot down layouts for the latest groundbreaking app. Small notebooks are all well and good, but sometimes the best notebook option might be a big, beefy thing that's going to last you a while. Enter the formidably named Master Classic notebook from Leuchtturm. Larger than A4, the hardcover comes stuffed with 233 numbered pages – choose from either ruled, plain, square or dotted paper, depending on your preference. If you're not after something quite so substantial, Leuchtturm also offers lots of other alternatives in different sizes and thicknesses. To give you an idea of the quality on the table, the company has been running since 1917 and its main rival is the new(ish) kid on the block, Moleskine. With so many different demands being placed upon notebooks, Baron Fig decided to ask the design community what they want out of a notebook and go from there. The result is the Baron Fig Confidant notebook, which from the ground up has questioned what a notebook is and what it can achieve. Pithy sales soundbites aside, the Baron Fig notebooks are truly gorgeous. Available in a soothing light grey or charcoal, the Confidant notebooks can open flat and contain plain, ruled or dot grid pages. Its quality acid-free fine grain paper makes the Confidant a dream to write in, whether that's with inks or pencils, plus this means the books are safe from degradation. They might be modest to look at, but Baron Fig lets its high-standard products speak for themselves. Bit of a wild card to finish on, the CIAK Pitti comes from Fiorentina, a European specialist in leather products and accessories. They're beautiful to look at and are extremely soft to the touch, and are sure to be one of the most luxurious places you can put your pen to paper. With contrasting elastic straps to keep the books secure when they're shut, and a dazzling lining that makes them pleasant to look at as well as use, the CIAK Pitti line really is in a league of its own in terms of style. The only catch? These books are only available to order as a wholesaler, with minimum orders set at $300. However, unless you're desperate enough that you want to order these books in bulk (and we really couldn't blame you), the kind folks at Fiorentina are happy to guide you towards the nearest retailer if you get in contact with them. It sounds like a bit of a hassle, but it sort of makes these elusive notebooks feel even more valuable if you are able to get your hands on one.